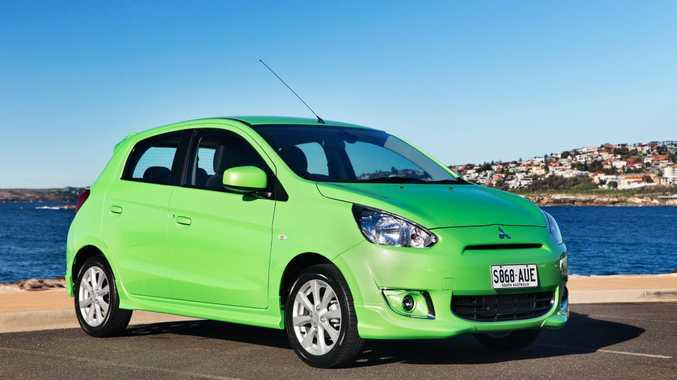 The limited edition Pop Green Mitsubishi Mirage. POP down the shops and Pop over to see some friends in this new limited edition Mitsubishi Mirage in "Pop Green". Only 400 units of the Pop Green Mirage LS Plus Pack are available starting from $16,990 drive-away - the automatic versions costs an extra $1000. Apart from the striking colour scheme, other external features are an air dam kit, chrome front bumper garnish, chrome tailgate protector and chrome fog lamp garnish. MMAL's CEO Mutsuhiro Oshikiri said the Pop Green Mirage represents a fresh, bold look that radiates personality and style. "We have taken the all-new Mirage to another level by offering more choice in our colour-line-up to suit each and every lifestyle. The Pop Green Mirage is a great small car that caters for those customers looking for a unique, fun colour option at an affordable price," he said. "Combined with a five-star safety rating, excellent driver manoeuvrability and outstanding fuel economy, this really is the perfect small car with a difference." The Mitsubishi Mirage has a five year/130,000km new vehicle warranty, five year Roadside Assist and Capped Price Servicing for the first four years or 60,000km of ownership.